This multi-layered British classic dessert consists of jelly, cake, fruits of choice, sherry, custard and topped with whipped cream. Displayed in an elegant glass or trifle bowl for an impressive look. 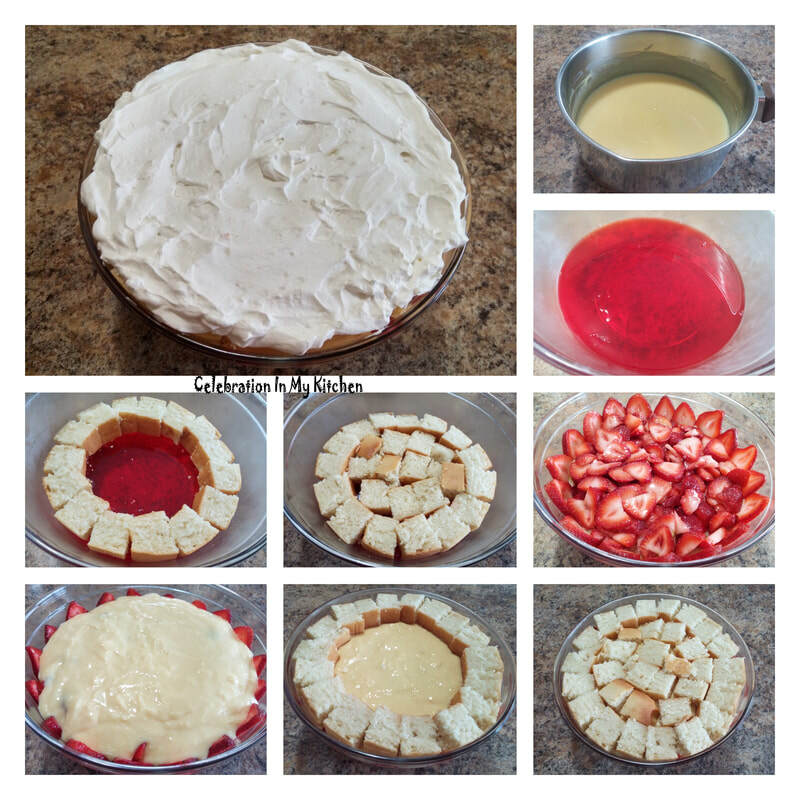 Great for entertaining, feeding a large crowd and using leftover cake. Trifles are popular at Christmas time, but can be enjoyed throughout the year. They are a perfect and satisfying finish to any meal. A spoonful of heaven with a combination of different flavours in every bite. 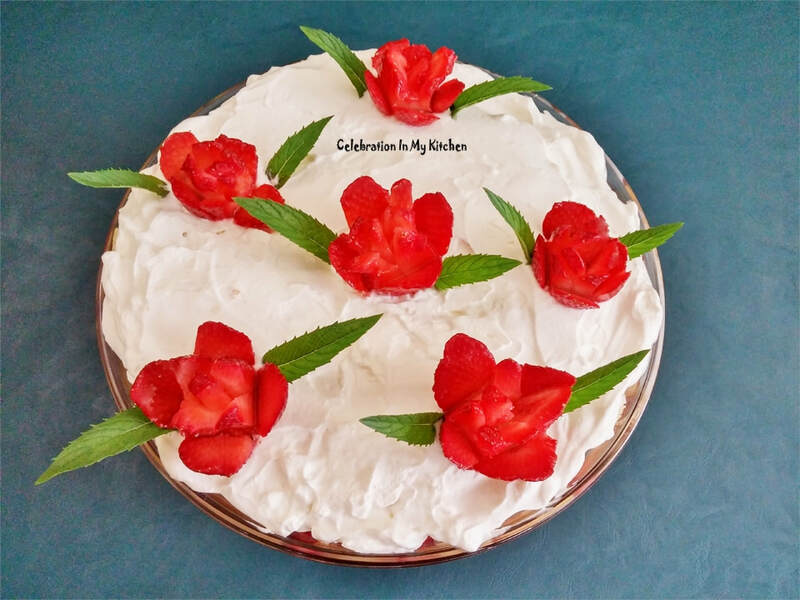 Now in summer when strawberries are in season, I decided to create this refreshing dessert using them with strawberry flavoured jelly, sponge cake baked at home, bird's vanilla custard and whipped cream for extra richness. 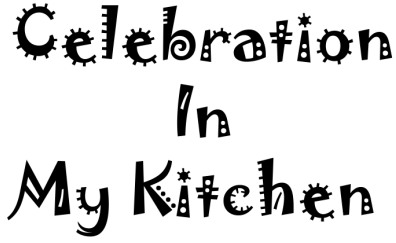 The cake can be made in advance, jelly set a day ahead and trifle put together with ease. A mixture of various fresh fruits can also be used. When serving to kids, it is better to skip out on the alcohol and make do with the fruit juices instead. 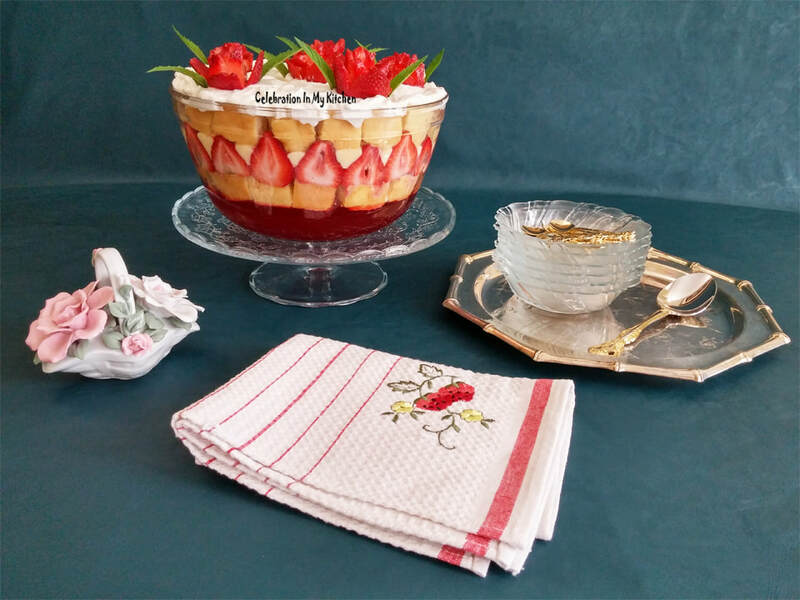 If you do not have a trifle bowl, show off the layers in any clear glass bowl (like I did) or individual glasses. Beautiful, a showstopper, tempting, delicious and irresistible. Combine gelatin with boiling water and stir until completely dissolved. Mix in the cold water and transfer jelly into the trifle bowl. Refrigerate for jelly to set. Grease a 15 x 10 x 1-inch pan and line with parchment paper. Using a stand mixer or with an electric beater, first beat the butter till creamy and smooth. Add the sugar and continue beating until light and fluffy. When sugar is well incorporated, add eggs one at a time. Mix in the dry ingredients alternating with milk and vanilla. Using a spatula, combine well and transfer to the prepared pan. Bake till a cake tester or toothpick inserted in the centre comes out clean, around 25 minutes. Cool cake completely before unmoulding onto a cutting board. Cut cake into squares or cubes and set aside. 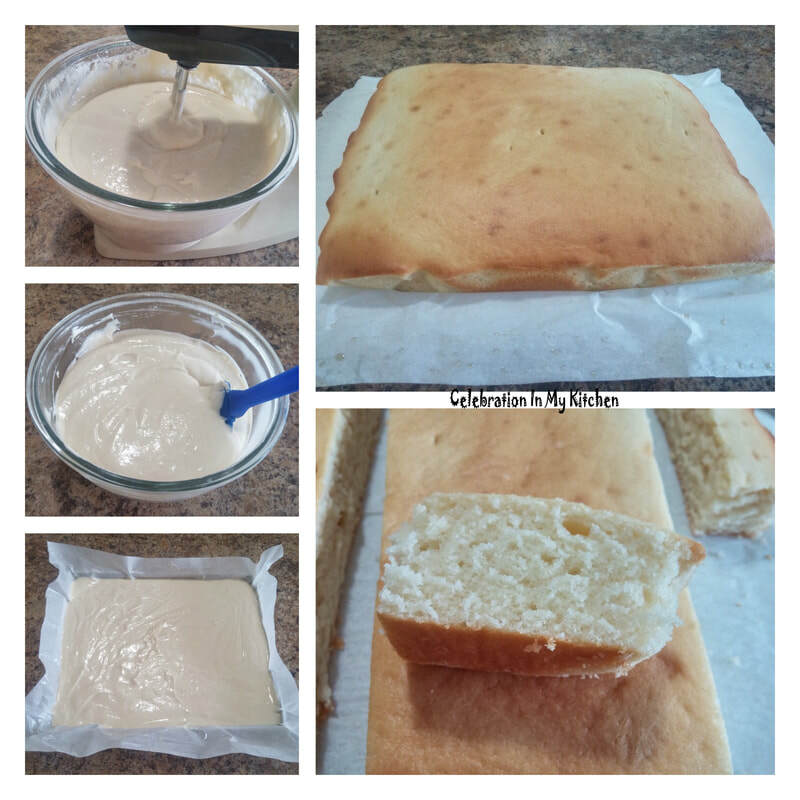 Cake can be baked in a round, square or loaf pan. Ensure to grease and flour the pan before adding the batter. Baking time will vary depending on the size of the pan used. For unsalted butter or margarine, used 1/8 teaspoon salt. Cake can be made a day ahead. Slice or chop the strawberries reserving a few for garnishing at the end. Sprinkle the chopped strawberries with sherry and set aside. 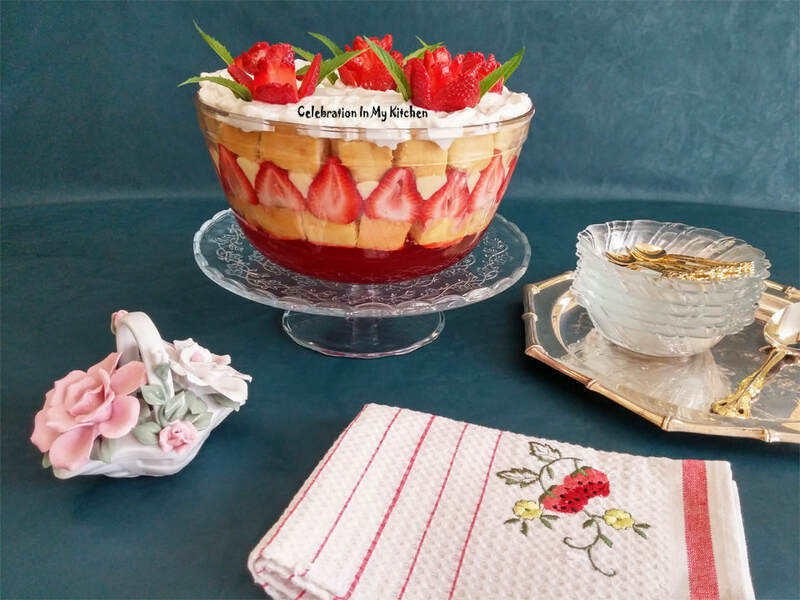 If serving trifle to kids, omit the sherry and macerate strawberries with 1 tablespoon sugar to release some of its moisture resulting in a flavourful syrup. Strawberries can be substituted with choice of berries or fruits. In a saucepan, combine the custard powder with little milk until smooth. Add remaining milk and sugar. With a whisk, stir continuously on medium heat until custard comes to a boil and thickens. Remove from heat. To prevent the custard from forming a skin, place a cling wrap directly on the custard. Set aside to cool. Freeze the bowl and beaters for 30 minutes. Beat the cream with sugar until stiff peaks are formed. Vanilla sugar can be substituted with confectioner's sugar and 1/2 teaspoon vanilla extract. Layer half of the cake on top of the jelly. Spread the strawberries over the cake followed by custard, balance cake and topped with whipped cream. Decorate with reserved strawberries shaped into roses. 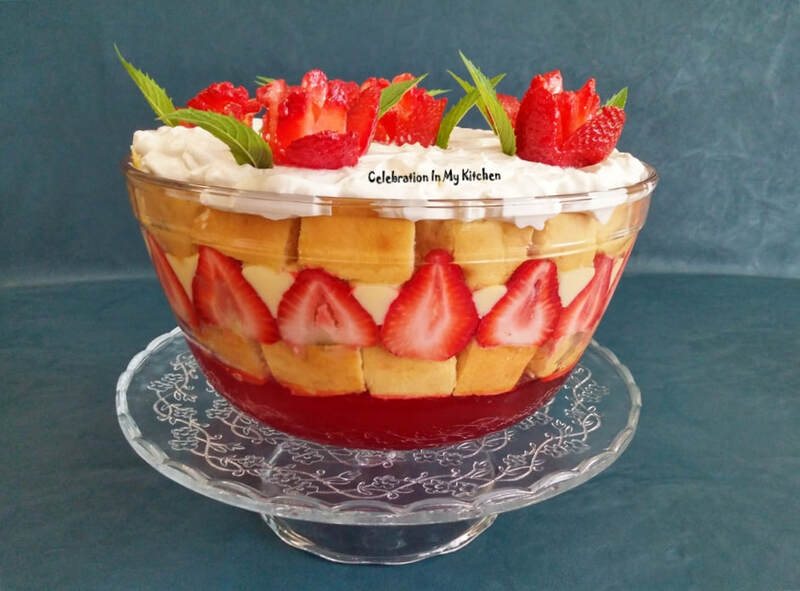 Trifle can be layered in individual small glasses. Depending on the size of your trifle bowl, above ingredients can be doubled or reduced into half. Whipped cream can be piped for an attractive look.